Happy National Dietitians Day: How I Became An RD and More! Hi Friends! Did you know its National Nutrition Month and in honor of that month Registered Dietitians get their own day!?!?!?!? I had so much fun finding these photos, oh man, dietitian humor is full force today, I can’t wait to laugh all day (PS RD’s Check Out This Pinterest Board it’s hysterical)! Anyways, I thought it would be fun to do a little Q & A about Dietitians as well as share how I became an RD. Are Dietitians and Nutritionists the Same? Fact: All Dietitians are nutritionists, but not all nutritionists are dietitians. I have tons of friends who have nutrition certifications (such as precision nutrition, ISSN, or even degrees) whom refer to themselves as nutritionists and they are very knowledgeable, so I’m not saying the term nutritionist is bad. However, if you’ve ever asked a Dietitian if they were a nutritionist and wondered why they took a deep breath and sighed before they launched into their explanation… see the next question. How Do You Become A Registered Dietitian? Complete required coursework (can be done in undergraduate or graduate school0 through an approved program (in other words you can’t just take the required classes you must be accepted into a program). Complete required internships and rotations including food service, community and clinical amounting to at least 2000 hours. The only picture I could find of me during my internship. Pass the National RD Exam—> This is no joke three sections: clinical, food service, and community. Hospitals, HMO’s or other health-care facilities, educating patients about nutrition and administering medical nutrition therapy as part of the health-care team. They may also manage the foodservice operations in these settings, as well as in schools, day-care centers and correctional facilities, over-seeing everything from food purchasing and preparation to managing staff. Sports nutrition and corporate wellness programs, educating clients about the connection between food, fitness and health. Food and nutrition-related business and industries, working in communications, consumer affairs, public relations, marketing, product development or consulting with chefs in restaurants and culinary schools. Community and public health settings, teaching, monitoring and advising the public and helping improve their quality of life through healthy eating habits. Universities and medical centers, teaching physician’s assistants, nurses, dietetics students, dentists and others the sophisticated science of foods and nutrition. Research areas in food and pharmaceutical companies, universities and hospitals directing or conducting experiments to answer critical nutrition questions and find alternative foods or nutrition recommendations for the public. 5. Completed Freelance Projects in writing, blogging, recipe development, presentation speaker, nutrition communications, food photography and more through my private company Hungry Hobby LLC (which includes this blog!). 6. Corporate wellness for University of California Riverside during one of my internships. I never knew what I wanted to do, so I went into my undergraduate degree at University of Arizona undecided and immediately switched to getting a business degree because it seemed like the most practical thing to do. However, I’d always been a bit of a science nerd so I decided to do a pre-health minor as well (basically pre-med prerequisites) with the plan that I would work in health care admin. At the end of my junior year of college I had put on 20lbs and was working to get it off, around the same time I was taking an upper level Biochemistry class which I fell in love with. It was the perfect combination of real life plus science that drew me in, I started researching careers in that field and by luck stumbled on the words “Registered Dietitian” which I had never heard before. Since I already had the science pre-requisites I only needed to take anatomy to be able to apply to graduate school programs (apparently they weren’t included in the pre-health minor since med school doesn’t actually require them). I used the find a program tool on the eatrightpro.org website (back then it was just eatright.org) and filtered for Coordinated Masters Programs. Since I knew I would be spending a lot of money on going to graduate school I wasn’t willing to risk my chances on not getting into an internship program (coordinated programs guarantee practice hours and an internship.) Once the list came up I applied to the Masters of Public Health schools on the west coast and some of the Masters of Science schools. I got into all of them, except I got waitlisted at Washington. I visited a few of them in California and scoped out one in Colorado but the one that seemed the most feasible and the shortest in duration, although unfortunately most expensive, was Loma Linda University. I began the program in Fall of 2011, finished in June of 2013, finished my last internship in August of 2013, and passed the RD Exam in October 2013. If I could go back… I would look at some of the didactic programs and try harder to get scholarships. As a business major I was unsure of myself and my abilities in the science field. However, at Loma Linda I ended with a 4.0 in addition to being selected as the first President of the Phi Upsilon Honor Society, while working and completing internship hours. I bet I could have spent less money at Arizona State University (in state), been with my family, and gotten into a competitive internship program. I also didn’t try that hard to get scholarships because I didn’t think that I would get them when up against nutrition majors. I also would reconsider my choice of a Masters of Public Health versus Masters of Science, I’m not totally sure I would change it but maybe. I didn’t think I wanted to work directly counseling people, I was thinking I would just put together programs, but I fell in love with it. Ultimately, I’m still happy where I ended up, hindsight is always 20/20 right? In honor of Registered Dietitian day tell me, what is your favorite kind of cake? If you think I’m gonna say something healthy like sugar free, oil free, strawberry cake made of air your wrong. My favorite type of cake comes from the pillsburry dough boy: FUNFETTI with EXTRA FROSTING. Did someone make me some for today? Haha! Loved all the memes in your article! I am an admin who has worked for RDs for over 10 years now and they all ring so true! Especially the nutritionist one!! 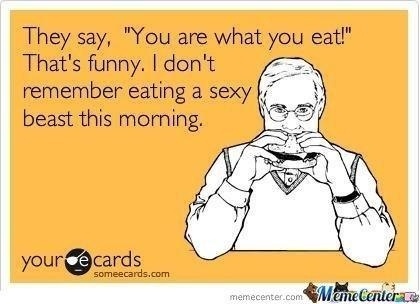 Another good one is when they get called “the dietary department”….grrr!! Happy RD day to you!! oh thats the worse! Thanks! Oh Happy Day Kelli! So proud of all your hardwork and perseverance as a Registered Dietician. Oh the fun we had on those road trips to see you! !